A sizable contingent of Australian Lithuanian sportsmen took part in the VIII World Lithuanian Games in Vilnius June 26 -28, 2009. About 2,000 sportsmen from 17 countries took part in the Games, which were part of Lithuania’s Millennium celebrations. representative Antanas Laukaitis is second from left. 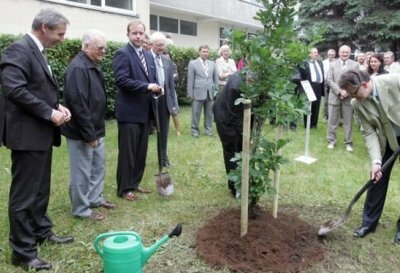 To commemorate the Millennium Games, a commemorative oak tree was planted in the square next to the department of Physical Education and Sport. The Games are under the patronage of President Valdas Adamkus, who himself had been the president of organising committee for the II World Lithuanian Games in Chicago, USA, in 1983. The III World Games were held in Adelaide, Australia, in 1988 and these were the first Games for which a contingent of sportsmen from Lithuania managed to break through the “iron curtain” and came to Adelaide to compete. The first World Lithuanian Games to be held in Lithuania took place in 1991, after Lithuania declared its independence in 1990. All subsequent Games have been held in Lithuania. The most successful result achieved by the Australian Lithuanian contingent was the spectacular win by the 17 year old golfer Andrius Belkus. He became the absolute champion in both the general and youth categories. With his 69 strokes win in one game he achieved Lithuania’s golfing record.